Electric flat die wood pellet mill is an ideal pelletizing machine mainly used for small-scale biomass pellets production for home heating. The raw materials for making biomass pellets are easy to obtain, like rice straw, rice husk, sunflower stalk, forestry wastes, wood chips, etc. Driven by electric motor, it is more energy-saving and environmental friendly. 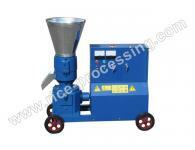 For both residential and small scale industrial pelletizing, flat die wood pellet press is no doubt a nice choice. 1.Raw materials are easy to get. Wood material, agricultural byproducts, even wood wastes from wood processing factory can be utilized to make wood pellets. 2.A good solution to turn local biomass wastes into value. 3.Highly compressed, regular and uniform shape ensures convenient storage and transportation. 4.More environmental friendly with little emissions discharged. Pellet fuel burning creates less ashes and emission, carbon neutral without exacerbating the global warming. Our company is specialized exporter, manufacturer and supplier of Electric Flat Die Wood Pellet Machine in 中国.